Thank you for your interest in this year's conference! 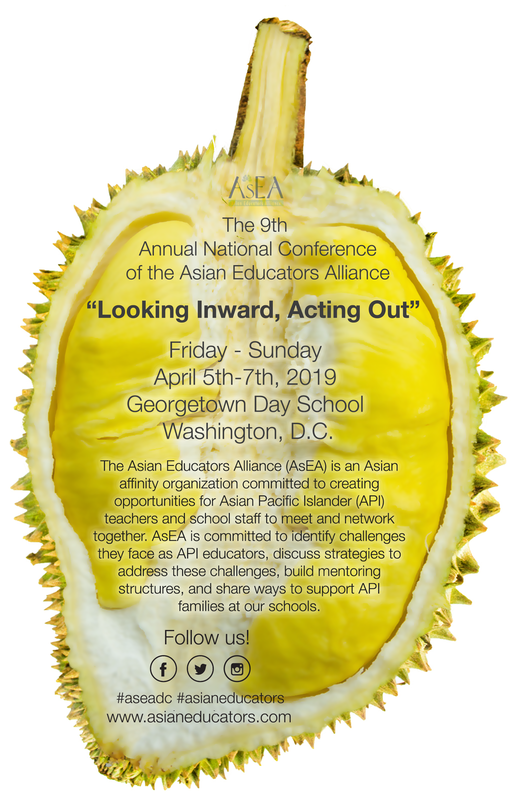 This will be the 9th Annual Asian Educators Alliance (AsEA) National Conference, hosted at Georgetown Day School in Washington, D.C. on April 5-7, 2019. During this time of increasing national divisiveness, it becomes more critical for individuals from marginalized groups to gather in order to reflect, connect, grow and find rejuvenation in our collective presence in order to better serve our students. Thus, this year’s Steering Committee has chosen the theme, Looking Inward, Acting Out, to both unite Asian educators as well as call us to continue working for a just and equitable nation for all. We ask for your support in two ways. First, please let your Asian Pacific Islander, South Asian (APISA) colleagues know about this important affinity space by forwarding the attached save-the-date flyers and empowering them to attend this conference. In addition, we ask that you support by serving as a sponsor of this event. Your sponsorship will highlight your commitment to supporting initiatives by and for APISA educators and will cover otherwise prohibitive conference expenses, provide financial aid for educators who are not receiving support from their schools to attend, and ensure the long-term viability of the conference. With your donation, your organization will be listed as a key sponsor and partner on our conference website (www.asianeducators.com) and include a link to your website where conference attendees can learn more about your institution and work. Your organization will also be included in conference materials, as well as in the opening and closing sessions of the conference. Last year’s conference was a resounding success, with over 100 educators participating in a diverse offering of workshops, panels, and speakers. Attendees have described this conference as one of the most fulfilling and enriching professional development opportunities that they have experienced; with your support, we can provide this experience to attendees once again. Thank you in advance for your support of this important event! ​Please feel free to download our conference poster and share it with your respective communities. Click on image to download conference poster.